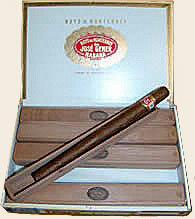 We guaranty authentic cuban Hoyo Particulares Edicion Regular cigars. The Largest and most nobel handmade Cuban cigars. colorado wrapper for this regular edition of the Particulares. These boxes were produced as a regular Habanos cigar atfer the Limitada 2001 batch.